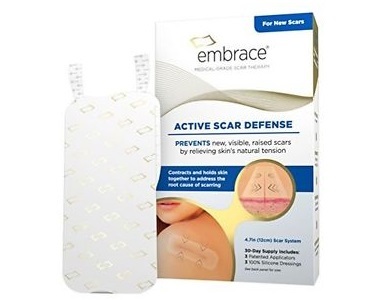 This review of embrace Active Scar Defense analyses its anti-scarring and car minimizing product claims, and its benefits as well as any drawbacks to consumers. Neodyne Biosciences, Inc has formulated what they say is a unique product. The uniquely designed applicator works by reducing tension on the skin. 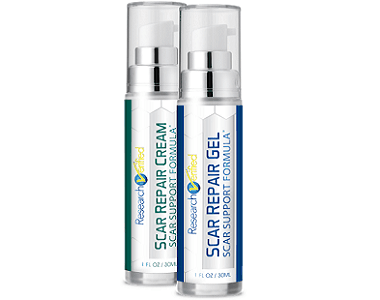 As tension is the key cause of scarring, the product consequently minimizes the effects of both old and new scarring. Red, inflamed and raised patches of skin should, says Neodyne Biosciences, Inc, appear significantly flatter, smoother and more ‘normal’ proper use of embrace. 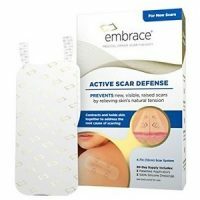 The embrace silicone-based patch with its medical-grade adhesive holds both sides of the incision together. When the instructions are followed, embrace is easy to apply and remove. Each application is designed to stay on for 10 days while hydrating the skin and is also waterproof and movement-resistant. What’s in embrace Active Scar Defense? Silicone – protects the scar tissue from bacteria and allows for better hydration of the skin’s upper layer, the stratum corneum. It also reduces collagen production. This is necessary because in the case of skin trauma, the body produces too much collagen to seal wounds, leading to unsightly raised scar tissue. How Do You Use embrace Active Scar Defense? The manufacturer recommends using embrace only on close, dry incisions, not open wounds. First, the tension relief should be activated by gently tugging on both sides. Align the applicator over the scar. The stripe in the middle should more or less match where the scar is. Once contact is made with the skin, hold the applicator in place for about 30 seconds. Gently remove the applicator, leaving the actual dressing in place. Leave each dressing on for 10 days. Allow the skin a break from the dressing for 12 to 24 hours between applications. The manufacturer recommends continuing with the treatment for 60 days, and advises that results will be seen up to one year of use. The products can be bought online from the product website or certain retailers. There are no high-volume discounts. However, the manufacturer does allow for payments to be split into two installments on its website. Some patients have found the cost to be prohibitively high. There is a 90-day refund which applies only upon the return of unopened products bought directly from the product website. There is consequently no way for a consumer to test whether the product is working for him or her before invoking the guarantee. In essence, this does not amount to much of a guarantee at all. The embrace formulation comes with a number of patents such as its Stress-Shield Technology, is gentle to remove and apply, and seems to address the heart of the causes of tissue scarring. The product shows promise and is backed by individual medical practitioners, with some patients reporting good results. Other patients have been less flattering about the results. Two of the main factors brought up by patients as mitigating against use are redness and the high cost. It is common for patients to report skin redness and irritation in the form of constant itching, with some ironically even reporting blisters due to tension from the strips. This suggests that possible the product should come with a warning of contact dermatitis to silicone, or an allergic reaction, in other words. The same is true of the medical-grade adhesive. There has also been mixed reaction to the adhesive with some patients giving it the thumbs up, and others claiming it to be not as strong or water-resistant as purported. In those cases, patients have resorted to holding the patch in place with tape. It appears that the dressing shifts depending on the position of the scar, with people who have scars in more awkward positions reporting more shifting. We recommend using one of the less expensive scar treatments on the market. It seems the results generated do not match the high expectations created by the price tag. Always test each product first before buying in bulk – and in this case that is not recommended due to the lack of a solid refund for any opened products. The consumer therefore has no way of testing the effectiveness of the product or whether they will also be subject to the widespread side effect itchiness reported.